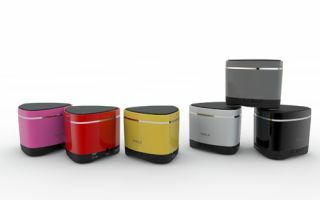 iWALK to launch new Bluetooth speakers for mobile devices | What Hi-Fi? iWALK has announced that it will be launching a new portable Bluetooth speaker for smartphones and tablets at Gadget Show Live 2014, which starts in Birmingham on 9th April. The Sound Angle Mini speaker is one of three new products being launched by the company at the show, along with a new backup docking battery and rechargeable backup battery. Features of the 3-watt Sound Angle Mini include four hours of music playback with shuffle capability; a Micro SD slot to play music without the need to connect; and a 3.5mm audio port. An in-built microphone also lets you make hands-free calls on your smartphone. The new product is going to come in a range of colours and is expected to cost £32.99 each. The Sound Angle Mini is iPhone, iPod and iPad-compatible and iWALK says the speaker will come with a fully-charged battery for use out of the box.